New members are always needed, why not start early? We are a small group of men and women between fourteen and eighteen years of age who make a difference within our community and local fire department by working alongside our towns bravest volunteers, learning the skills necessary for the day when we serve as senior members of The Richmond Fire Department. The Richmond Fire Department Junior Firefighters are hard at work responding to emergency calls; we work behind the scenes as the interior firefighters fight your biggest fear. 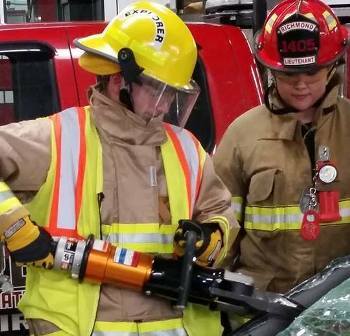 We train as firefighting and truck operations, motor vehicle extrication, wilderness rescue and firefighting, fire ground rehabilitation, basic first aid, and CPR. Several of our members have undertaken a higher level of training by enrolling in the New York State Certified First Responder course. First Responders provide a critical role in pre hospital patient care by being the first trained personnel to assess and treat those subject to illness and injury, CFR's are trained just under the levels of EMT's. In a way you could say we are some of Richmond’s bravest young men and women and take pride in serving our community. 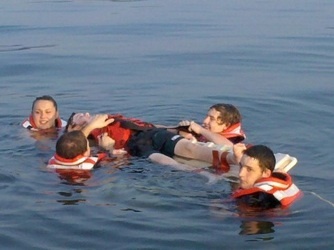 Explorers stabilizing a mock patient for transport to the rescue boat during a drill. 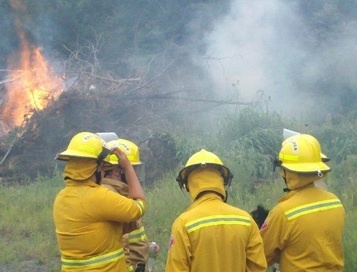 Jr Firefighters on scene at a live brush fire drill. Jessica is now an Interior firefighter, EMT, and appointed Assistant Chief in 2017 She is currently attending MCC for fire protection science, as well as working with the Fishers Fire Department. She is currently Co- Advising the Richmond Fire Department’s Explorer Program, and has recently become a nationally certified fire instructor. David is an Interior Firefighter, EMT, and appointed EMS Lieutenant in 2014. 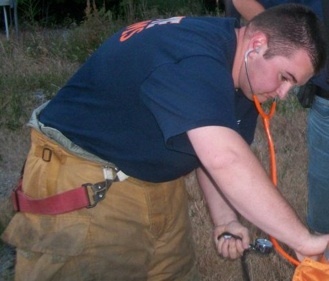 David works as an EMT Skills Instructor for MCC, and FLREMS as well as a CPR Instructor. He works as an EMT for the Canandaigua Emergency Squad, and is studying to become an Paramedic.